Dan Perlman is a stand-up comedian and writer from New York City. Dan performs stand-up every night at some of the top clubs andalternative rooms in the city, recently headlining Caroline’s on Broadway. Dan created and wrote an animated series, That’s My Bus!, which received a pilot order from FOX after winning 1st place at the Montreal Just For Laughs Festival. Dan has appeared on TruTV, MTV2, and as a cast member on MTV’s Vidiots. As a writer-filmmaker, he has had four projects featured in the New York Television Festival, most recently the award-winning comedy series, Flatbush Misdemeanors, in which he co-stars and co-writes/directs. On radio, Dan was a writer for SiriusXM’s Bennington and Comedy Contributor for Neil deGrasse Tyson’s StarTalk Radio. Dan wrote for the 2017 WGA Awards, hosted by Lewis Black, and the 2018 WGA Awards, hosted by Amber Ruffin. 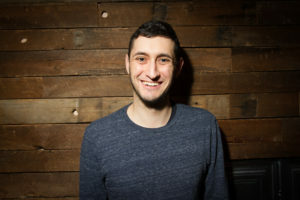 As a stand-up, Dan’s festival credits include New York Comedy Festival, SF Sketchfest, Boston Comedy Festival, New Orleans Hell Yes Fest, and Finger Lakes Comedy Competition (2015, 1st place).